The Car of Tomorrow - Yesterday! 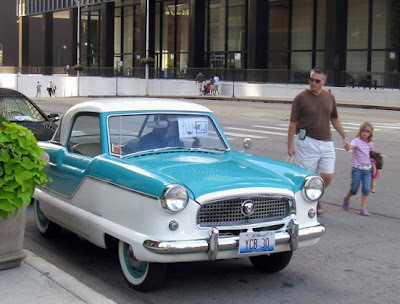 Wednesday afternoon, the towers of Marina City were like a giant Christmas tree, one beneath which the most marvelous toy had been placed - a gleaming turquoise and white Nash Metropolitan. 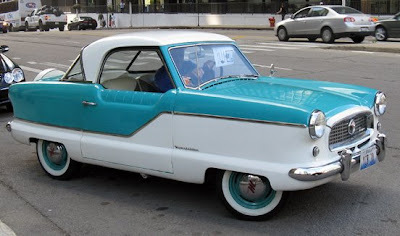 Probably one of the few cars ever to be described by automotive writers as "cuddly," the British manufactured Metropolitan was introduced in 1953, and survived only until 1962 model year. 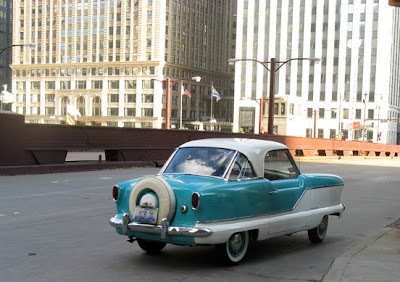 Designed by William J. Flajole, it was half the weight of an average sedan, with a fuel tank that only held 10.5 gallons. 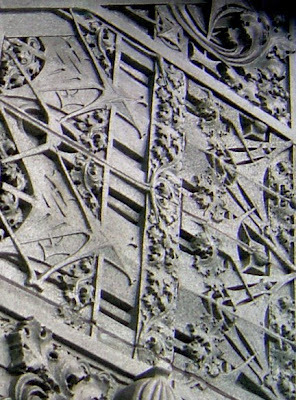 In an era when heavy metal could have to be said the primary design motif, consumers didn't quite know what to make of it. In our own time, however, when SUV's have become economic millstone around the necks of their owners, the Metropolitan looks like the perfect fit for a $4.00 a gallon world. A subcompact long before the term had even been invented, it offered 30 MPG "in traffic" and up to 39.4 MPG at 45 MPH. While in its own time, it was a laughable choice for a four-member nuclear family, for the empty-nesters of today, it's the perfect bite-size. If Apple had come out with an iCar, this is what it might have looked like. 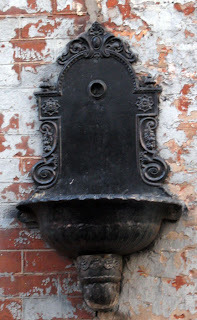 Read all about the Metropolitan on Wikipedia here, and see a gallery of photo's here. And so we bid you a fond farewell, our petite jaunty friend, as you glide across the river and over the horizon. Fair skies and good riding, YCB 30, wherever you are. 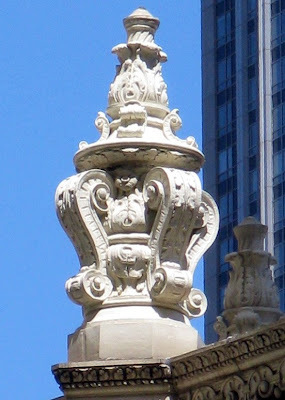 On-street video gets no respect at the Chicago Tribune, In 2006, art critic Alan Artner dumped on the 40-foot-high "sculpture"/sign tower outside of ABC7's State Street studios. 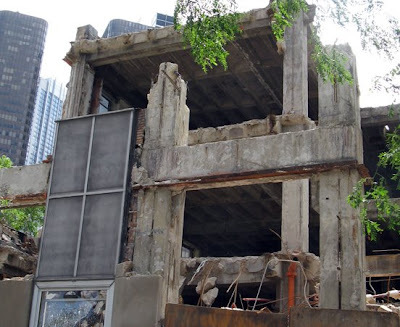 Today, it's architecture critic Blair Kamin, writing in his Skyline blog, ripping the video board for the new sidewalk studio CBS2 is completing on Dearborn across the street from Daley Plaza. I thought Artner's critique was a bit silly, decrying ABC7's bringing of "light pollution" to a district that was once replete with glittering marquees. Kamin has a better gripe. 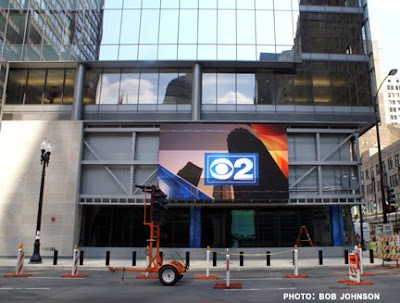 The CBS2 studios occupy the base of architect Ralph Johnson's handsome new Morningstar tower at Dearborn and Washington. What was, in Johnson's original design, a continuous 80-foot-wide video band has become a clunky square board 30 x 19 feet. Set against it's now predominantly empty supporting frame, it's taken on the makeshift quality of one of those homespun wood "Gas/Food - 10 Miles" signs you find rotting along the sides of old highways. 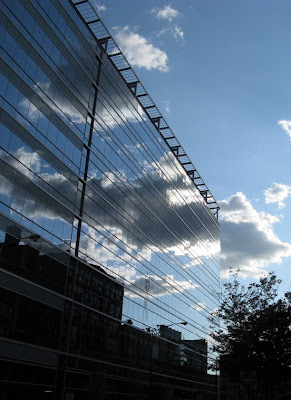 The CBS2 Studios occupy the site of the 1871 McCarthy Building, whose official city landmark protection was hurriedly revoked so it could be demolished and left a vacant lot for the following decade and a half. The Block 37 curse lives. Read Blair's take, and some interaction with readers posting comments, here. 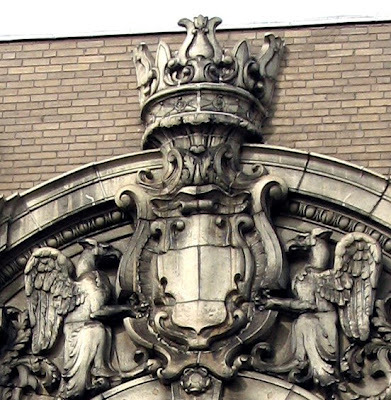 Uptown Redux - Today's Trib also offers Chris Jones' report on the historic, beleaguered and crumbling Uptown Theater finding itself in court today, where it will be sold off to the highest bidder. Bad news would have it falling in the hands of another slumlord with good lawyers. Good news would be a purchase by either Jam Productions or Live Event, promoters with deep enough pockets to raise the over $40,000,000 estimated to be required to bring the 4,300 seat Uptown back to its full movie palace glory. Read it all here. Postscript: Crain's Chicago Business is reporting that Jam Productions has purchased the Uptown for $3.2 million, plus the aggreement to resolves another $1.8 million in lines against the property. Read it here. 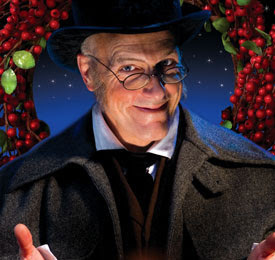 And you thought those early back-to-school ads were scary . . . .
Tickets for Goodman Theater's annual production of A Christmas Carol begin to go on sale Friday (internet pre-sale for special people, of which, for some reason, I appear to be one - August 4 for phone sales.) Tickets go on sale to the general public on August 22nd. The production opens November 21. Big Air's Solvency Plan: Gouge the Rubes! In a hopeful sign that the Chicago Tribune newsroom hasn't yet been totally decimated by wholesale job cuts, Sunday's edition has a great story by Julie Johnnson on how big airlines like United are attempting to repair their shattered finances. Those flying the long Chicago to San Jose run are getting a bargain, paying less than a third of the actual cost of getting them to their destination. The poor schmoes in Grand Rapids and Gillette, on the other hand, pay up to close to three times the cost of their fare. The potential for this strategy to balance UAL's budget, however, is questionable. Can you really find enough profitable runs carrying thousands to balance out the red ink expresses carrying hundreds of thousands? Airline deregulation has proven to be like the opening of the Ark at the climax of the first George Lucas Raiders. The unleashed spirits at first take a beautiful form, but soon grow so frightening that the only remedy is to look away. Deregulation created the cheap air fares that made air travel accessible to everyone and then, in a common trajectory of unbridled capitalism, pushed everything to debilitating extremes. Even as their services reached incredible heights of popularity, Big Air's finances grew increasingly desperate. Now, no middle ground remains between luxury - for those for whom money is no object - and steerage - for everyone else. At first, Big Air's campaign to make air travel as close to unendurable as possible - passengers packed in cabins like sardines, multiplying delays, no meals, no snacks, charges for bags, charges for pillows, flight attendants reduced to animal tamers - seemed to be just a matter of corporate leadership's gross incompetence. After reading Johnssons's analysis, however, it's beginning to look like it might also be a deliberate financial strategy. I've written before about the joys of being to listen on-line to concerts from the Proms, the massive music festival occupying London's Royal Albert for the next couple months. Saturday evening's concert, which you can hear for the next week, is an engaging example, with the insanely talented composer Thomas Ades conducting the City of Birmingham Symphony in a vibrant performance of his massively ambitious Tevot, a Hebrew word that can mean "bars" as in a musical score, "ark" as in Noah's, or the basket in which Moses floated on the Nile just before he was rescued by Anne Baxter. In an interview with the London Guardian, Ades explained, "I liked the idea that the bars of the music were carrying the notes as a sort of family through the piece... But I was thinking about the ark, the vessel, in the piece as the earth. The earth would be a spaceship, a ship that carries us - and several other species - through the chaos of space in safety. It sounds a bit colossal, but it's the idea of the ship of the world." After a couple of hearings, I still haven't quite taken the measure of it, but it makes me want to back and listen still again. You can hear it yourself, here. The entire wonderfully overstuffed concert begins with a performance of Night on Bald Mountain, and the monologue and death scene from Boris (we tried to get Ivan but he wasn't) Godunov, sung by John Tomlinson. Check it out here. If that's not enough, the program ends with Borodin's Polovtsian Dances, complete with soloists and chorus. Before that Louis Lortie appears as soloist in a glittering performance of the Prokofiev Piano Concerto Number One in d, which, along with the Shostakovich 1st Symphony, is one of the great career calling cards of 20th century music. Often treated with critical disdain, the concerto is one of Ades' - and my - favorite works. After hearing Prokofiev, himself, play it in 1914, songwriter Vernon Duke enthused that it overflowed with "unrelenting energy and the athletic joy of living." Hear it here. Only six days left. 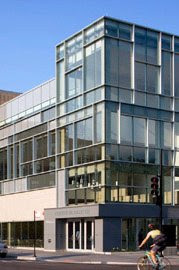 In 1955, it represented "Excellence in Architecture" according to that year's AIA Chicago design awards. Today, it's coagulated landfill. 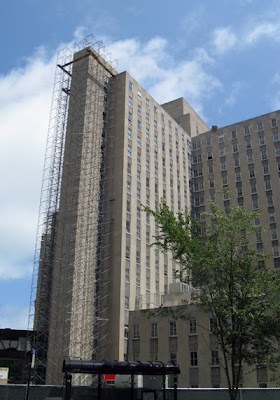 Scaffolding has climbed up the streamlined 17-story high slabs of Schmidt, Garden & Erikson's Lakeside Veterans Hospital, which was closed by the VA in 2003, and demolition is well under way. A new project, as yet undisclosed, will incorporate the site into the Northwestern Hospital/Rehabilitation Institute campus. 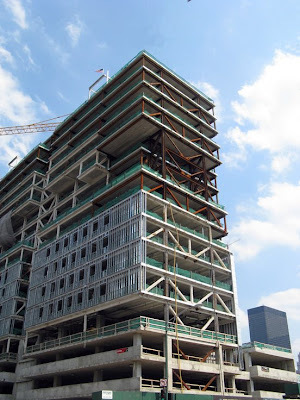 Do you notice Bertrand Goldberg's Prentice Hospital looking a bit nervous and sweaty as it overlooks the deconstruction? Friday is the last day on which nominations will be accepted for the 5th annual Community Vision Awards, "recognizing projects and communities that demonstrate excellence in applying sound land use principles and demonstrate best practices within the Chicago region." The award is co-sponsored by ULI Chicago, the Metropolitan Planning Council, the Home Builders Association of Greater Chicago and the Metropolitan Mayors Caucus. Nominated individuals must be under 35, whose "personal and professional goals embody the Urban Land Institute’s commitment to sensible land-use, civic spirit and community involvement." 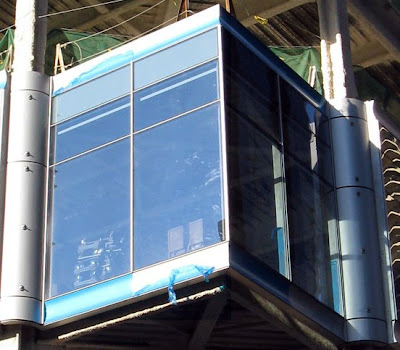 Projects must demonstrate "leadership between public and private project team." You can download the nomination info packet here. 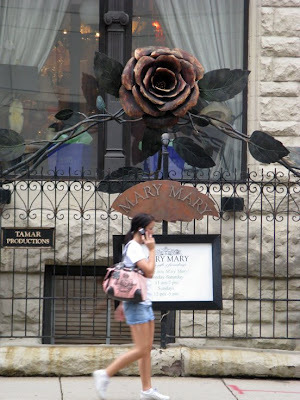 Among 2007 winners was The Center on Halsted. 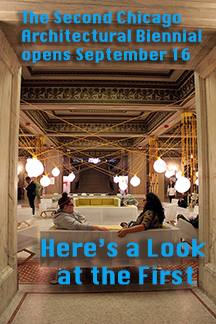 Prizes include a $500 voucher towards a ULI Annual Fall meeting or a Professional Development course. 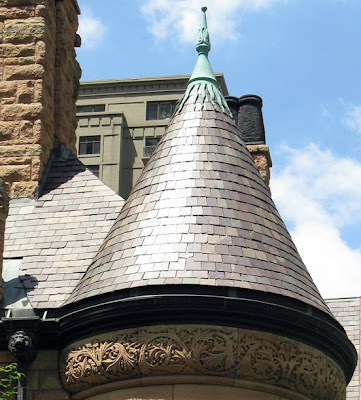 If it's the really big money you're after, there's the $200,000 Richard H. Driehaus Prize, the anti-Pritzker, "awarded annually to an outstanding architect or firm whose work applies the principles of classicism, with respect to sustainability, to the built and natural environment. 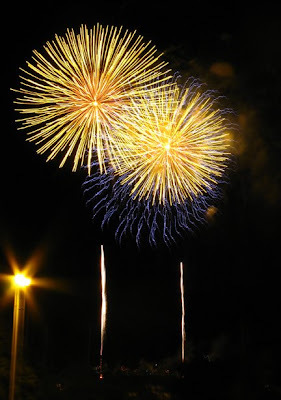 It is the largest unrestricted prize of its kind." 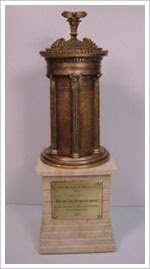 The University of Notre Dame began accepting nominations on July 22nd, with a September 15th final deadline. Nominations, open to the general public, can be made, on-line here. 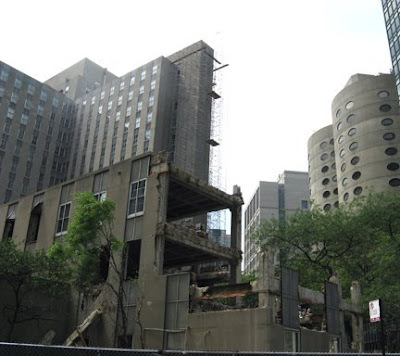 I can't believe that they'll be left this way, but right now there are an increasing number of skeletons piling up in Chicago's construction closet, courtesy of an imploding real estate market. 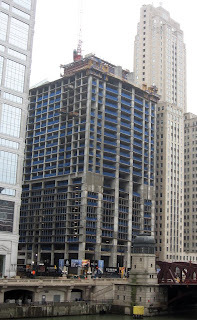 Crain's Chicago Business reported last week that work has ground t o a halt - again - on 90-story Waterview Tower at Wacker and Dearborn. 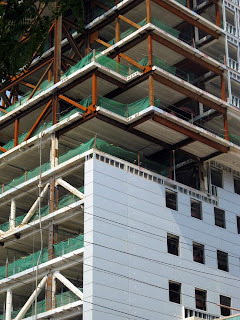 "Paperwork" - and the fact that everyone in China is apparently concentrating on the Olympics - is the reason being given for the delays in closing on a $340 million construction loan from the Export-Import of China, a deal that would also see developer Teng & Associates being replaced as general contractor by Beijing Construction. The Sun-Times' David Roeder reports that a "buy China" rule will be put into place for construction material when/if construction resumes. Crain's also reported last week that construction has halted on the the Duke Miglin hotel, the Valerio Dewalt Train designed project formerly known as Staybridge. The innovative structure that represents the first use of staggered truss construction in Chicago was supposed to open this summer, but now all bets are off. And then there's the Santiago Calatrava supertall, the Chicago Spire at Ogden slip. A year after they began, Case Foundation appears to have finished their work. 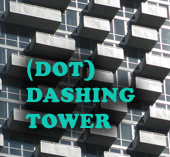 According to The Spire's website, a "top-down" method of construction will be used to fill out the structure's buried parking garage, beginning with the building of the plaza level, including the lobby and the tension ring supporting the seven exterior columns. "Once plaza works have been completed, the engineers excavate a level below and create a stable surface for poured concrete. Further excavation work takes the building down another level - and another concrete slab is poured. The work is repeated for seven levels until the base of the foundation is reach. 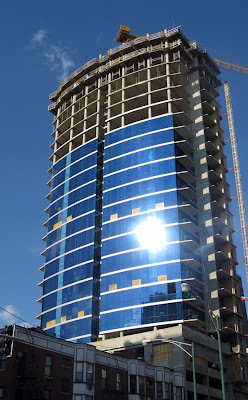 Work the core of the building can now begin." Still, as can be seen from this photograph from our indefatigable correspondent Bob Johnson, the site looks preternaturally quiet. No general contractor has yet been named for the project's construction, and the announced 2010 completion date seems to be falling into the realm of fantasy. 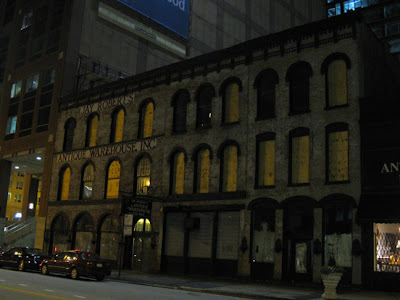 A stretch of Kinzie street has gone dark recently as the Jay Roberts Antique Warehouse has suddenly disappeared, leaving behind an empty building with windows alternatively soaped or boarded up. 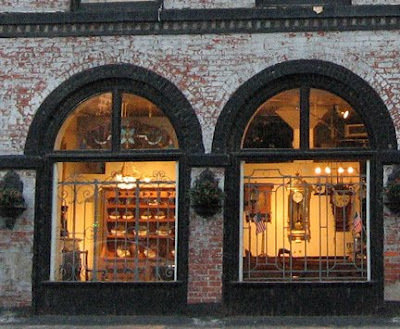 The Warehouse, a Kinzie Street mainstay whose lighted shop windows kept the street aglow, is one of the cases where even the building was subject to antiquing. A call to the phone number listed on the Jay Roberts website was answered not by a gallery staffer but a gentlemen who said, yes, the building is under construction, that they'll be back, but it will take a long time. We can only hope. So that you may not be the martyred slaves of Time, be drunk, be drunk without ceasing. With wine, with poetry, or with virtue, as per your taste. They like to call themselves "The World's Greatest Classical Music Festival", and with 84 concerts over 8 weeks, who's to argue? And you can come, too! 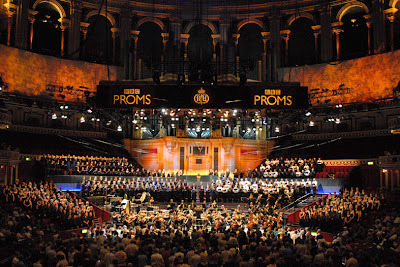 The 2008 season of the London Proms starts today, Friday, July 18th. Every concert can be heard live. Since they're six hours ahead of us, you can listen to evening concerts in the afternoon and the afternoon concerts at breakfast. Or you can catch up with them at your convenience - each concert will be available for internet streaming for seven days after. 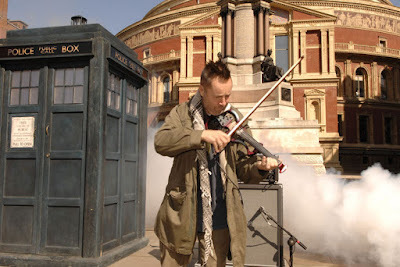 Violin virtuoso Nigel (the artist formerly known as) Kennedy kicked off this year's festival with "a unique performance of the Dr Who theme music on the south steps of the Royal Albert Hall," complete with phone booth. Last year, I caught on to this cornucopia rather late, but still heard an otherworldly performance of the Mahler 3rd with Claudio Abaddo conducting his Lausanne Festival Orchestra, and an almost impossibly blazing performance of the Shostakovich Tenth with wunderkind and LA Phil music director-designate Gustavo Dudamel leading the phenoms in his Simon Bolivar youth orchestra. You can see the full listing for 2008 here. It's an amazing mix of beloved warhorses like the Brahms 2nd (concerto and symphony) and adventurous programming like major retrospectives of the work of centenarian Elliot Carter and Olivier Messiaen. (Prom 6 this coming Monday, July 21st, actually pairs L'Ascension and Et exspecto resurrectionem mortuorum with the Saint-Saens Organ symphony.) In addition to the aforementioned Nigel Kennedy, there's Pierre-Laurent Aimard, a Glyndebourne production of Monteverdi's Coronation of Poppea, with Danielle De Niese, a Stockhausen day on August 2nd (Gruppen and Stimmung), Leonard Slatkin conducting Adams, Bernstein and Ellington on August 8th, Barenboim conducting his West-Eastern Divan Orchestra in Schoenberg, Brahms and Boulez (the 14th), Pierre Boulez conducting Janacek - Sinfonietta, Concertino and the Glagolitic Mass - on the 15th, Gergiev conducting the complete Sleeping Beauty on the 20th, the St. John Passion with John Elliot Gardner, Danielle Gatti, Lyric's own Sir Andrew Davis, Lorin Maazel and the NY Phil, The Berlin Phil Rattling the Turangalila, prefectly preceded by the Tristan Prelude and Liebestod, on September 2nd, a complete Saint Francis of Assisi, and, for the Last Night of the Proms, Bryn Terfel, Hélène Grimaud, and the BBC Symphony under Roger Norrington. Not to be left out, the Chicago Symphony will be making appearances on September 8th and 9th with Bernard Haitink conducting the Mahler 6, Shostakovich 4th, and the Mozart c minor, K410 with Murray Perahia. If all that doesn't leave your head spinning, well, I pity the fool, as a classical music addict might say. Check it all out here. At a Wednesday press conference in the CTA's Blue Line subway just north of Randolph, CTA President Ron Huberman led a press demonstration of the agency's latest innovation. "We had begun to exceed our capacity for rush hour passengers," Huberman explained. "We've been studying the changes airlines are making to address their own critical problems, and we thing we can take it that extra step. By basically "shucking" riders out of the confinement of "L" cars, we can place them on fast-moving, continuous conveyors. Combined with the simple act of reducing the volume of weight we have to carry by removing unnecessary passenger body parts, we will satisfy the exploding demand for rush-hour capacity, slash capital costs, help make Chicago the world's greenest city by consuming a lot less energy, and provide our riders the kind of speed and reliability that they deserve." At the same press conference, Huberman announced a ambitious marketing plan centered around the CTA's new slogan, "The CTA - What Other Choice Do You Have?" All seats to be removed from CTA "L" cars. 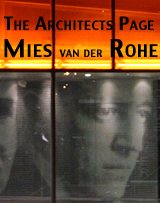 A late addition to the July calendar of architectural events. Grant Park Updates: At 6:30 P.M. tonight (Tuesday, July 15th) at Daley Bicentennial Plaza, 337 E. Randolph, the Grant Park Advisory Council/Grant Park Conservancy will be offering updates on the New Chicago Gateway Harbor, Buckingham Fountain restoration - $25 million rejuvenation and some design changes, the plan for the southwest corner of Grant Park at Roosevelt and Michigan, the Chicago Athletic Association Building - 12 S. Michigan, Congress Parkway streetscaping - $20 million renovation of Congress Parkway from Wells to Grant Park, and a discussion of Steering Committee for Daley Bicentennial Plaza reconstruction. Also: Polycarbonates are all around you - just not on Thursday, July 17th. 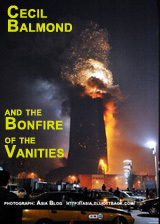 The AIA/Chicago lecture with this title at the CBA has been cancelled. Finally, the talk by Elvis, Pelvic Variations in Polycarbonate Structures, scheduled for 9:25(a) P.M., has been postponed indefinitely, but may sighted at random K-Marts at later dates. A great Steven Colbert rant on why the other guys's are bigger, in which New Yorker architecture critic Paul Goldberger actually gets in a word edgewise (although never two in succession.) So, are we now the world's doty grandpa? 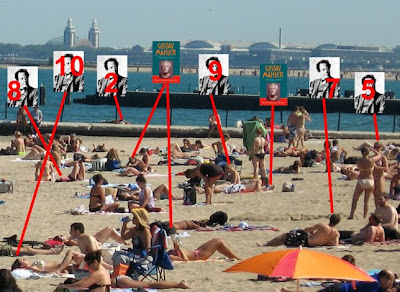 Sunday looks to be a beautiful day, and what spells out "perfect beach day" better than immersing yourself in the life and music of the man who battles Igor Stravinsky and Anton von Webern for the title of Greatest 20th Century Composer, the pride of Kalischt: Gustav Mahler. Start with the recently published fourth and final volume of Henry-Louise de la Grange's monumental biography of the composer, A New Life Cut Short. At 1,788 pages , there's over a page for each day of the last three and a half years of Mahler's life. If you head to the sand early, you might get as far as that first performance of Tristan at the Met by the time the sun disappears behind the Chicago skyline. And then, as a soundtrack for your reading, fire up the browser on your new i-Phone and head to the BBC-3 website, where you can hear the last five concerts from a complete cycle of Mahler symphonies with Valery Gergiev leading the London Symphony. You can stream the broadcasts up to a week after their initial airing, which means you have until tomorrow to hear the Gergiev/LSO Resurrection, with similar contracting windows of opportunity for the 5th (coupled with a performance of the Karetnikov #4), the 7th (with Schoenberg's Chamber Symphony), The Symphony of the Thousand (from St. Paul's Cathedral, with a decay time on the final note that seems to last until the following Tuesday), and the 9th, preceded by the Adagio from the unfinished 10th. A New Life Cut Short, $140.00. iPhone 3G, $199.00 to $434.00, plus monthly service plan. Spending a sunny Sunday on Chicago's beautiful lakefront with a few thousand very close neighbors and Gustav Mahler's astonishing life and world-encompassing symphonies of joy, foreboding, despair, love and inexhaustible longing: priceless. Keith Dinehart of Goldberg General Contracting has brought to our attention an extended piece by Joann Gonchar in the July Architectural Record on the restoration and renovation of the 1923 Krause Music Store at 4611 Lincoln, in Chicago. The Krause Music Store is like the Mozart Requiem, a commission that the artist created in full foreboding of his own mortality. 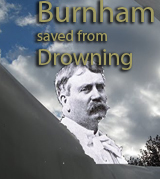 Sullivan would die 1924, penniless, in a converted linen closet at the Hotel Warner. The Krause Music Store is his final testament. If you want to be strict, you could say it's too much, that we've seen it all before, but that's beside the point. The way the bowered entrance draws you in, through an embrace of tendrils, is like a spiritual portal to the hidden, better world we all want to believe is there, just on the other side of the glass, wanting only our Beatrice to show us the way. 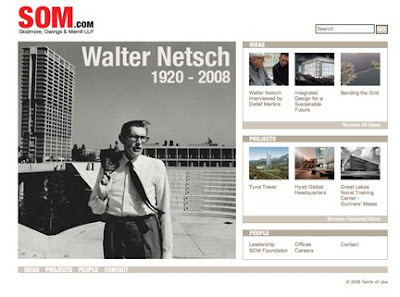 After his death on June 16th, the home page to Skidmore, Owings and Merrill's website became a memorial to Walter Netsch, who spent his entire architectural career at the firm. There's a brief tribute to Netsch, and, more importantly, a link to an extended interview Detlef Mertins conducted with Nestsch in 2001 at his north side home. There's a lot of discussion of Netsch's unique field theory, in concept and practice. Netsch talks about collecting leaves as a small child and studying their patterns, and later using chrysanthemum flowers and ginkgo leaves as inspirations for individual projects. 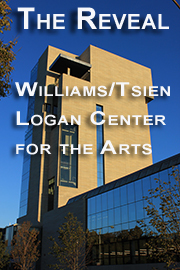 He names the library at Wells College as the favorite among his designs. The interview is accompanied by a generous selection of drawings and photographs. 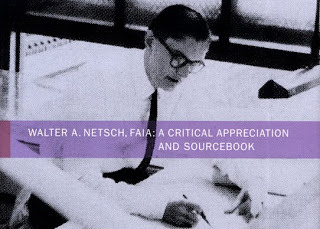 Blair Kamin reports on his Skyline blog that just before he died, Netsch was able to see an advance copy of a new book from Northwestern University Press, Walter A. Netsch, FAIA: A Critical Appreciation and Sourcebook, a compendium offering a short biography, an annotated bibliography, and essays from people like Robert Bruegmann, David Goodman, Martin Felsen and Sarah Dunn. 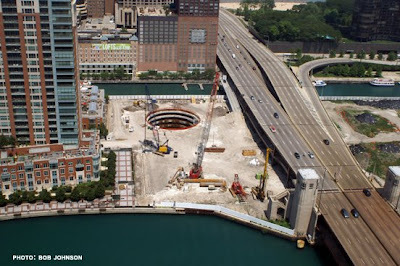 The first photo is of the lakefront south of Diversey. 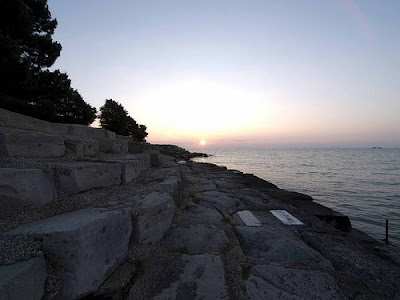 The second is from a series of handsome photos of Promontory Point by Lee Bey that he's recently posted on his great Urban Observer blog. 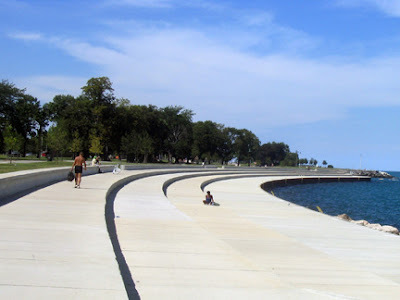 The Diversey style has become of standard for renovation of Chicago's lakefront revetment, and it was what the city and Army Corp of Engineers had proposed for Promontory Point a decade ago. 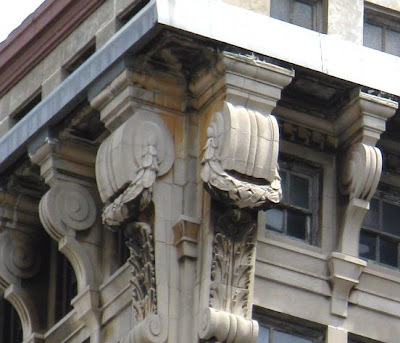 When, for some unfathomable reasons, South side residents rose up in rebellion at that plan, the city presented a "compromise" that entailed reproducing the limestone rocks in concrete. Same, same, no? There have been further redesigns that would now retain some of the rocks, coupled to universal access to the Point, but the changes remain so radical that community opposition remains unabated. 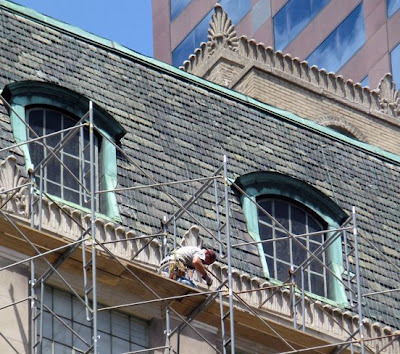 The Point was on Landmarks Illinois 2004 "Most Endangered" list and Preservation Chicago's 2006 "Chicago Seven"
Late last year, Congress passed a bill funding a proposal backed by Cong. Jesse Jackson, Jr. and Senator Barack Obama for a third party study of renovating the Point in a manner consistent with national preservation standards. At first glance, you can see how the solution seen in the first photo would appeal to bureaucrats. It's clean and simple- simplistic, actually - universally accessible, easy to maintain and probably beloved by the city's liability lawyers. It's great uninterrupted sweep makes a striking first impression. After that, however, you realize that's there's absolutely nothing else to engage your interest. It's an expressway for moving bicycles and people with the least possible resistance, a giant stretched condom sheathing the observer from any conception of the natural intersection of water and land. Like the design for a children's museum in Grant Park, it is both relentlessly efficient and fatally devoid of the poetry of good urban design. This is one case where efficiency kills, choking the natural wonder of the lake in a concrete necklace. You can see from his original 1937 design for the Point that Alfred Caldwell had clear and creative answers on how to mediate city and lake. Too often, our current planners don't even seem to realize that there's a question. Archeworks Open House - Chicago's alternate design school will be holding its summer open house this Wednesday, July 9th, from 5:30 to 7:00 P.M., 625 N. Kingsbury at Ontario. Prospective stduents will be able to meet new co-directors Martin Felsen and Sarah Dunn, tour the studios and learn about current courses, plus get info on applying. Call 312/867.7254 for more details. International Planning History Society - here's one we're sorry we didn't get around to writing about earlier. 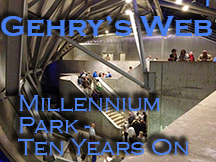 The Society meets only every five years, and this year it's in Chicago, Thursday the 10th through Sunday the 13th. Public versus private planning: themes, trends, and tensions, the theme of this year's event may sound a bit generic, but it's a cover for a blockbuster schedule of what appears to be over one hundred papers. Topics covered will range from Carl Smith, Kristen Schaffer and Neil Harris talking about New Perspectives on the 1909 Plan of Chicago, to a keynote by Alexander Garvin, discussing the 21st Century relevance of Baron Haussman, Daniel Burnham, Robert Moses and Edmund Bacon with conference co-hosts and organizers Robert Bruegmann and Christopher Silver, to breakout sessions on everything from sanitation in 19th Century Sao Paulo, to zoning in British Hong Kong and a world of locales and topics in between. Registration for non-members is $380.00. Pre-registration is closed, but the chronically tardy are promised they can download the "registration form, complete and bring it with you to Chicago. We’ll take care of you when you arrive." Most events will be at the Chicago Marriott Downtown on North Michigan. You can find all the info, including links to downloading the registration form and a complete schedule, here. 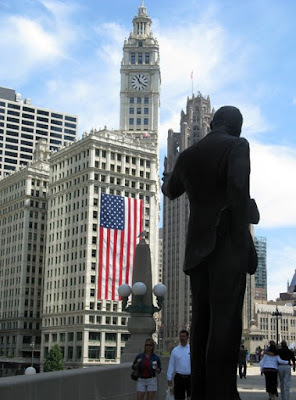 A photo essay on a Chicago Glorious Forth - this year's fourth, to be exact - in flags and buildings and in the sky. See it all here. Crain's Chicago Business is reporting today that Perkins+Will is acquiring Environments Group, the largest independent interior design firm in Chicago, more than tripling, to a staff count of 90, its number of interior design group employees. The acquisition will build on Perkins+Will current Eva Maddox led Branded Environments division. 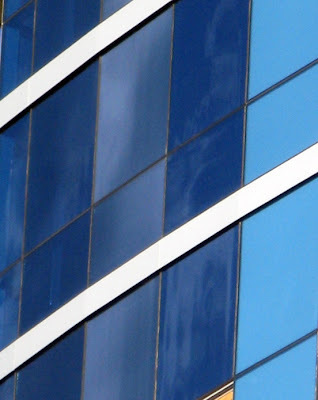 Environments Group currently has offices in Illinois Center. Perkins+Will has offices in Mies van der Rohe's iconic IBM Building, now renamed 330 North Wabash. Read the story here. On deadline with big project this week. Will post when possible.